Successfully Added TX92 Android TV Box - Bluetooth, WiFi, Google Play, 4K Support, Android 7.1, Octa-Core CPU, 3GB RAM, DLNA (32GB) to your Shopping Cart. Enjoy hours’ worth of fun and entertainment from the comfort of your own living room with the TX92 Android TV Box. This sophisticated Android Media Player features an extremely compact and easy to use design. Simply connect it to your TV, and you’ll be able to enjoy all your favorite Android features on your big screen television. Treating you to Android 7.1, you can be assured that this Android TV box handles the latest features and TV Apps without any delay. It even supports WiFi connectivity thanks to which you’ll be able to browse the web, stream media, and download files on your television. This sleek Android TV box supports 4K resolutions. From now on, you’ll be able to enjoy films, series, and sports games in Ultra-HD resolution. By treating you to vivid color and extreme detail, this 4K TV box truly lets you undergo a cinematic experience. Your Android Media Player supports both Google Play and TV Center v17.4 access. Thanks to this, you’ll never have to worry about feeling bored again. With the ability to download millions of the latest media files at the blink of an eye, this Android TV box keeps you entertained at all times. With its Octa-Core processor and 3GB RAM, the TX92 Android TV Box brings forth a smooth and powerful performance. It lets you tackle the latest software, games, and 4K films without dropping a frame. With a sufficient 32GB ROM and 64GB SD card slot, it treats you to all the memory needed to store your files. Your 4K TV Box additionally supports Bluetooth, DLNA, Miracast, and Airplay to further increase your user experience. 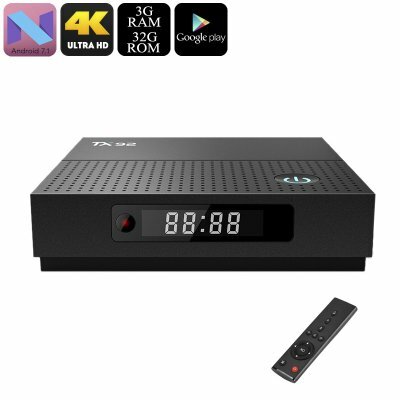 The TX92 Android TV Box comes with a 12 months warranty, brought to you by the leader in electronic devices as well as wholesale Android Media Players..